The L.I.F.T. 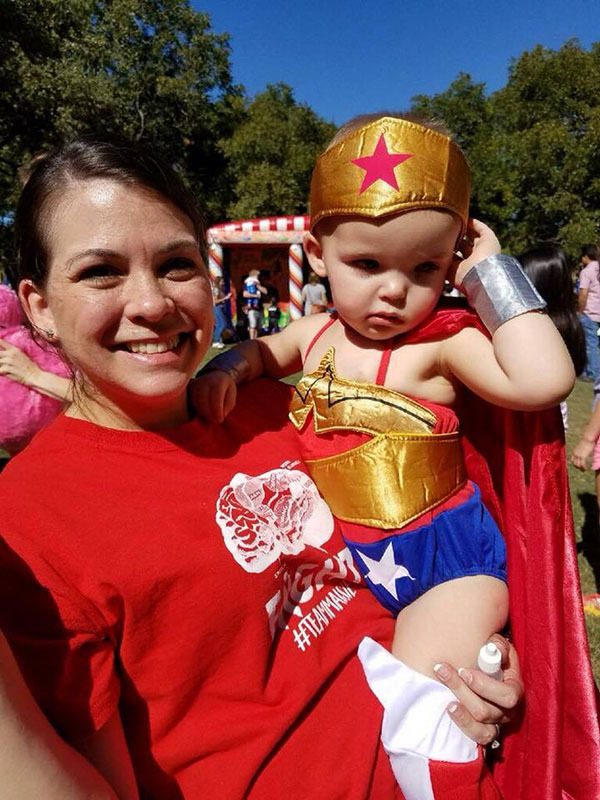 (Love in Fragile Times) program serves childhood oncology patients and families in crisis by meeting a need to reduce their stress or lift their spirits. Requests are meant for patients experiencing a crisis affecting home life, living situations, relapse in disease, and end of life support. When Maisie was around three months old, we noticed she had a lazy eye. It wasn’t obvious, and it didn’t seem to bother her so we waited to have it checked out. Our pediatrician referred us to an ophthalmologist at her 18 month well check. Coincidently, Maisie had been having random bouts of nausea the same week. The ophthalmologist said her optic nerves were swollen, and Maisie needed to have an MRI to rule out a tumor. The following day, Maisie was vomiting every couple of hours. On May 7th, 2017…our lives changed forever. We took her to Dell Children's Medical Center, and she had an MRI done that evening. The scan showed a tumor the size of orange in the posterior fossa of her brain. The tumor had wrapped so tightly around her brainstem that she developed hydrocephaly (fluid in the brain) which explained the nausea and vomiting. She was taken to surgery the next day to have a drain placed in her brain to remove the built-up fluid. The day after that, she had a 10-hour operation to remove as much of the tumor as possible. The tumor was wrapped around almost every cranial nerve, an artery and her brainstem. The neurosurgeons were able to remove 90% of Maisie's tumor causing minimal damage to her quality of life. We spent the next four weeks at the hospital helping Maisie recover from her surgery. She was diagnosed with Ependymoma, a rare type of brain cancer found in children. During that stay, she had another surgery to have a permanent VP shunt (brain drain) placed, as her brain had forgotten how to reabsorb spinal fluid. She had to learn how to talk, swallow, sit up and walk all over again. Once we were able to go home, we were back a week later for Maisie's first round of chemotherapy to treat the residual tumor. Then, a week after that, Maisie was admitted for neutropenic fever. It was during this stay that Maisie's baby sister, Kennedy, was born. 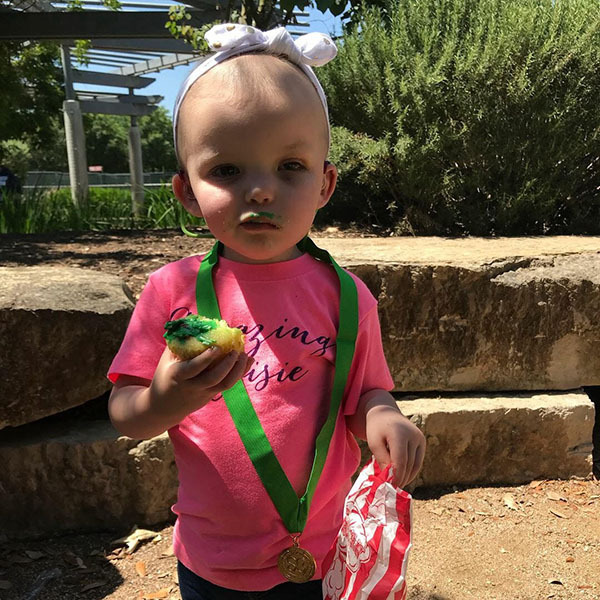 Maisie underwent two rounds of chemo, a second resection of her tumor, 33 radiation treatments followed by four more rounds of chemo all over ten months. Maisie is 95% back to where she was, physically, before her surgery. Cognitively, she hasn't missed a beat. She's back at school with her friends. She loves being a big sister and she is one of the toughest little girls we know. We are forever grateful to have the outcomes that we do. What we will never forget, is in the midst of our chaos, there was an organizations in the background waiting for the opportunity to help us. Without us having to ask, B.I.G. Love Cancer Care was helping us stay on our feet while we took time off of work to take care of our family. Because of all that we have experienced, our family created #TeamMaisie to give back to the same community we will forever be a member of, the pediatric cancer community. 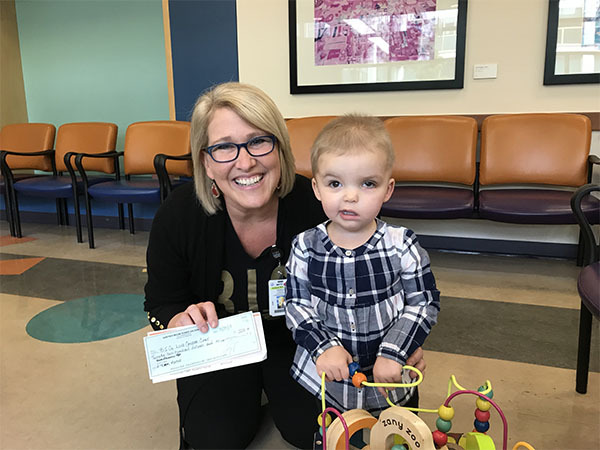 Our mission is to raise funds for families actively fighting pediatric cancer; to help these families pay household or medical bills, while they fight with their children to beat pediatric cancer.